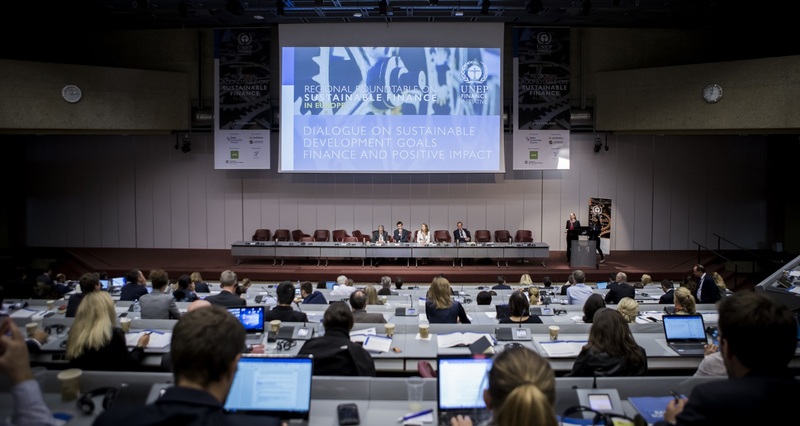 To celebrate UNEP FI’s 25th Anniversary, more than 200 UNEP FI members, supporting institutions, sustainable finance professionals and members of civil society gathered in Geneva recently at UNEP FI’s first roundtable tailored for the European sustainable finance community. A challenge was laid down to the banking industry by surprise speaker, Christiana Figueres, and we welcomed new members and supporting institutions, while covering the key Environmental, Social and Governance issues facing financial institutions today. The final piece of news was the location and timing of the next UNEP FI Global Roundtable, which will take place in Paris exactly three years after the historic Climate Agreement to which it lends its name was reached there in December 2015. The first day of the roundtable started with two exciting announcements. At the Principles for Sustainable Insurance (PSI) Market event, UNEP FI’s Butch Bacani welcomed Zurich Insurance Group to the list of PSI signatories and Linda Freiner, Group Head of Corporate Responsibility spoke on how Zurich is integrating ESG issues into its insurance business. WWF Switzerland on behalf of the global WWF organization, announced that they are to become a PSI supporting institution, and WWF’s David Patterson shared how WWF-SIGHT online mapping platform is bringing together environmental and development datasets. UNEP FI is very pleased to have two of the largest and most influential organisations in their respective fields collaborating with us, and being able to draw on their considerable experience. A surprise guest joined proceedings on Day 2: Christiana Figueres, former Executive Secretary of the United Nations Framework Convention on Climate Change (UNFCCC), and one of the architects of the Paris Climate Agreement, connected to the roundtable via live video conference. She reminded everyone present that, “We have run out of time for anybody at the table to have a you-first attitude”, and laid down a challenge to the banking industry. To avoid a 2 degrees scenario, she urged banks to invest a ratio of 2:1 in favour of low carbon investments over high carbon investments, with high carbon ones to be rapidly phased out, and to achieve this goal by September 2018 when leaders from governments, cities and businesses around the world meet at the Global Climate Action Summit in San Francisco, USA. She also encouraged banks to look at creating principles for sustainable banking – an option which UNEP FI banking members will be considering as part of a project already underway: a review of the UNEP FI Statement of Commitment. You can watch a pre-recorded message from Christiana, filmed ahead of the conference here. More members confirmed their commitment to the efforts towards increasing transparency when two leading French banks, and UNEP FI signatories, Société Générale and BNP Paribas joined the Task Force on Climate-related Financial Disclosures pilot project bringing the total of UNEP FI members banks involved to sixteen. Jean Laurent Bonnafé, CEO of BNP Paribas commenting on why the bank has joined the pilot group said, “We’re a long standing partner to the energy sector and we’re determined to support the transition to a more sustainable world. As an international bank, our role is to help drive the energy transition and contribute to the decarbonisation of the economy”. Société Générale Chief Executive Officer, Frédéric Oudéa commented, “Société Générale has been a firm supporter of the Task Force on Climate-related Financial Disclosures in its work to develop a greater transparency on climate-related financial risks and opportunities. This is ensuring a common framework for disclosures across sectors. It is an important milestone in the process of transition to a lower carbon economy, in which the bank plays an active and sustainable role”. The final big announcement of the event was the location and timing of UNEP FI’s next Global Roundtable, the key international agenda-setting event on sustainable finance. Anne-Claire Roux, Director of Finance for Tomorrow and Philippe Zaouati, CEO at Mirova, announced that the next UNEP FI Global Roundtable will take place in Paris in December 2018, reaffirming the city’s role as a hub for sustainable finance. Paris-based Finance for Tomorrow is a member of UNEP FI’s Positive Impact Finance initiative, and Mirova, the second-largest European manager of open-ended SRI funds and social business funds is a UNEP FI signatory, also headquartered in Paris. Register your interest here. Many other sessions took place including the opening from Elliott Harris, UN Assistant Secretary-General and Head of UN Environment New York Office, and member of UNEP FI’s Global Steering Committee, the keynote delivered by René van de Kieft, CEO, MN, as well as discussions on the progress made in sustainable finance; how taking a positive impact approach to investing can help deliver the Sustainable Development Goals; the finance sector’s resilience to environmental risk; opportunities in financing energy efficiency investments, and what a rights-based approach to sustainable finance means for financial institutions. At a side event, Swiss Sustainable Finance asked, “What is Impactful Wealth Management?” and how is sustainable investing influencing private wealth management based on findings from their recent report. Similar discussions will be held at UNEP FI’s next two regional roundtables taking place firstly in Johannesburg, South Africa, an event tailored for the finance community in Africa & the Middle East on 27 – 29 November, followed by the Asia Pacific Regional Roundtable in Tokyo, Japan on 11-13 December. Don’t miss your chance to get involved, by browsing the agendas and registering for the Africa & Middle East roundtable here, and the Asia Pacific roundtable here. To read more about UNEP FI’s achievements over the last 25 years, read Georg Kell’s article here. Watch Christiana Figueres’ challenge to UNEP FI’s banking members here. Click here to register your interest in the next Global Roundtable #GRT2018, taking place in Paris in December 2018. Read more about our latest member, Zurich Insurance Group here. Interact with a timeline of the evolution of sustainable finance and key milestones in UNEP FI’s history here.